Kale is a superfood because it is rich in antioxidants, vitamin A, vitamin C, vitamin K, calcium, magnesium and potassium. It is also fibrous and its sulphur content has liver cleansing properties. Growing kale in garden is easy, even you can grow kale in pots. Details on how to grow kale from seeds and seedlings are given below including planting time, caring and its harvesting. Kale is a plant which can be grown as an ornamental plant as well as an edible plant. A very good kale variety to grow for ornament and edible purpose is Tuscan black kale which is also known as Cavalo Nero or 'Nero de Toscana' or dinosaur kale. The kale (Brassica oleracea acephala) vegetable plant is colorfully decorative and good to eat. Their finely curled green leaves can be used as tasty garden green salad. It is a member of the cabbage family. It is a hardy, cool-season plant. It can tolerate temperatures below freezing! It is similar to broccoli in growing habit. Dwarf Kale varieties grow to 45 cm tall and 60 cm wide. The most important point about how to start a kale plant is to choose a correct position for growing. Plant kale in full sun if planting during the cool season, but in partial shade if planting in a warmer climate. Kale is a cold weather crop, it takes 12 - 16 weeks to mature. 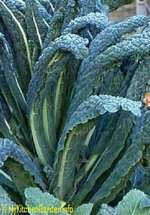 Kale seeds should be sown in autumn and seedlings in early winter. Frost will sweeten the taste, while heat turns kale bitter. In Australia, sow in February-March for a winter harvest as it prefers cool temperatures. Kale prefers loamy (sand, silt and clay soil types), well-drained moist soil with a pH between 5.5 to 7. Add a good amount of compost and aged manure into the soil. Loamy soil is ideal for most garden plants because it holds plenty of moisture but also drains well so that sufficient air can reach the roots. You can start from kale seeds or kale seedlings, but not cuttings. The best way to grow Kale is from seed, however, very young seedlings will also grow well. Sow seeds half an inch deep, 12 inch apart in 18 inch rows or plant seedlings at the same spacing. Water well. Keep the soil evenly moist throughout its growth. Grow 2-3 plants for each member of your family so that you get kale regularly. You can also grow kale in pots. If growing in pots or any containers, take a pot of size 10 inch or more. Put mulch such as sugarcane around the plants. It will contain the moisture inside the soil, avoid weeds and keep the leaves clean. Mix good amounts of compost and manure in the soil before planting. Mix some N-P-K (5-10-10) fertilizer. Add more compost around the plants throughout the growing season. Also give a liquid fertilize or blood and bone or seaweed solution every the week. Keep your plants well watered. Keeping the soil moist will produce the leaves sweet and crisp. Kale is attacked by aphids, cabbage moth, cabbage worms, snails, slugs and cutworms; and some soil-borne diseases. Mulch the plants and remove any dropped leaves to keep the plants clean to reduce insects. Crop rotation is recommended, do not grow the cabbage family plants in the same place in the following year. You can cut outside leaves off the kale plant when the plant is approximately 10 inches high. Young leaves can be used in salads and mature leaves can be cooked. Ensure to harvest kale leaves before they become too mature and tough. To harvest the whole plant, cut at two inches above the soil. The plant will grow new leaves in about 2 weeks. Kale enjoys companion plants such as beetroot, celery, herbs, onions and potatoes. Do not plant near near beans, tomatoes or strawberries. A Kale plant take two years to go to flower. The flower does not contain the seeds, but are in a seed bud near the flower. Cut the seed pod when it has started to dry, split the pod and take out the seeds. These seeds are good for replanting. The kale flowers are dense and leafy heads in exotic purple and pink foliage.